Sugar River Fun and the other racer. Have you heard of Danica Patrick? She started racing in karts when she was 7 at is Sugar River Raceway, a half mile knot of a track. After talking about going here for awhile now, things just lined up and we went. Baseball playoffs were on the schedule for Saturday, and a Sunday race just felt right. This was going to be a “fun race”, not points for us. Just an opportunity to have a race day cold and see how fast Jason could learn a new track. The rules were a little different too. He drove an unrestricted LO206 with 6 in (as our normal opposed to 5″) rear tires. His first practice session was pretty bad the kart was very loose and we were both a little discouraged. But we knew the kart just needed some tuning and he needed a pep talk. The second practice was much better – only 2 seconds a lap behind the regulars. Just before heat 1, I was informed he was hitting the limiter. That was good news since it meant he was fast, but bad news because I couldn’t fix it – the heat was starting too soon. Heat 1 was less than 2 seconds a lap slower. Fixed the gears for heat 2 and now he was just about a second behind. In the feature he started 7th and drove hard to keep up. Two of the regulars spun and Jason slipped by for 5th place. One driver retired but the other tried in vain to get by Jason who, although slower in the corners, did not give ground and was able to pull away in the straights. He took the checkered flag for 5th. He was very pleased to have started to made real headway on the track in such a short time. He definitely rose to a very difficult challenge. 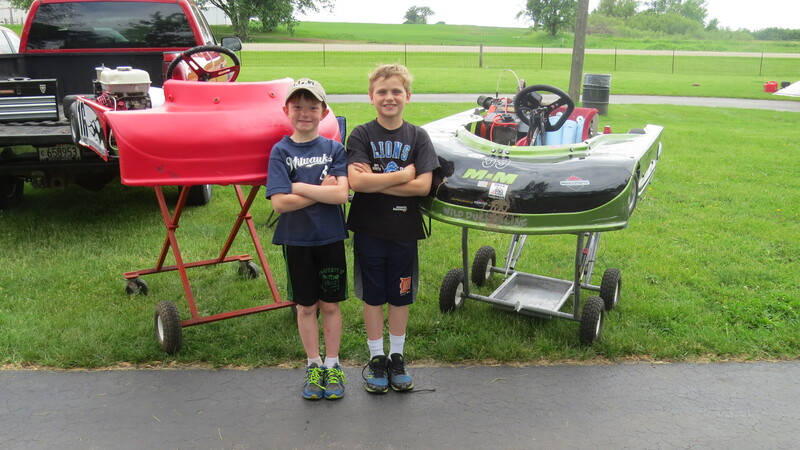 An interesting note, during his very last kid kart race at Road America, Jason met a 4 year old boy named Blake. This weekend, Blake appeared again, a little older and a little bigger, racing his own kart with the JR1 class at Sugar River. It is great to reconnect with old friend no matter where ever we go. So, why is there a horse on this page? Well, my daughter Katie rides horses and occasionally competes in rodeo events. She has been riding since she was 6 and they had to find a special small saddle for her back then. Now she is bigger and loves to find horses she has never ridden and figure them out and get them to figure out who to reach them. It’s one thing to put a car/motorcycle/kart though is paces on the track you are in total control. When you are riding a horse, it has it’s own brain and some how you and the horse must find some common ground and work together. This is western style riding. It originated with the folks that used to work horses for herding so the style is a little less formal then the very strict English style. Western competition in this are of the country does not include the cattle because, frankly, they are hard to come by. Katie is in the Open division of showing which means she has earned either a “high point” or “reserve high point” – first or second place overall in a show. 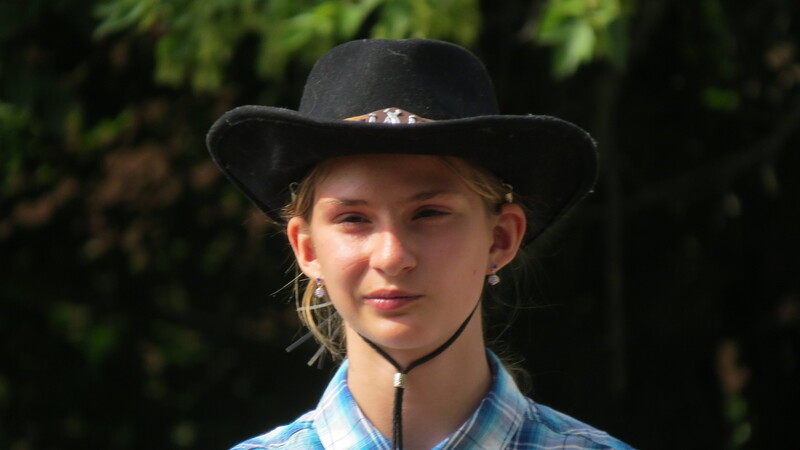 She won reserve high point a couple of years ago, and moved up into tougher competition, with riders up to age 18 or so. There is a showmanship class, in which a rider demonstrates how well they can move a horse in and out of different gaits (walk, jog, lope) and sit nicely in the saddle. The rider’s back should be straight and they need to be “tight” in the saddle, which means minimal bouncing at the faster gaits. Competition in this class is fierce with many of the other riders have are older and have more experience. While, Katie is a good solid rider she is still working on the many niggling details. Ribbons are given for 6th place on up, but Katie did not happen to place in this particular class. After showmanship comes the barrel racing. The rider follows a cloverleaf pattern around three barrels arranged in a large triangle. Fastest to complete the course is the winner. 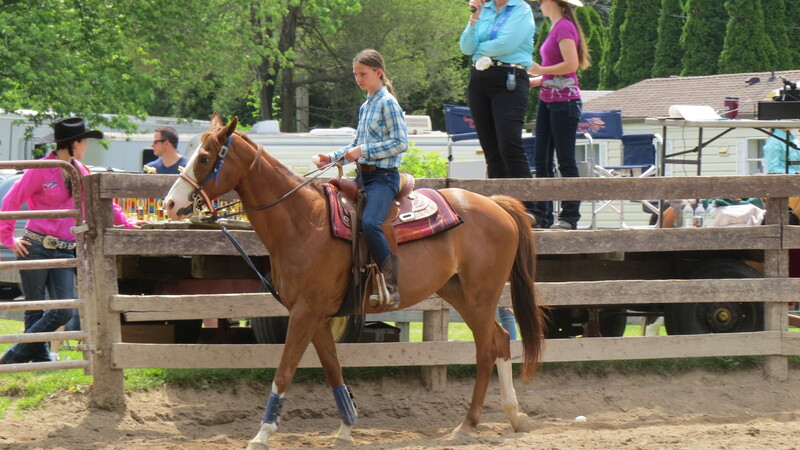 Barrel racing is Katie’s favorite, and she placed 3rd – highest ever in this class. In true rodeos, riders really do pole bending, here it is just poles. There are six poles set up in a straight line, and you ride your horse as fast as you can, weaving through the poles. The very fast riders bend the poles back and forth as they charge through. If a pole is knocked down, you don’t score. Katie took third in poles, which was her first ribbon in this class. Katie’s last riding class is flags, the barrels are set up in the same pattern as for barrel racing, but the rider follow a simple triangle. As the rider races by the first barrel she grabs a flag out of a bucket of sand. the around the far barrel, finally as they race by third barrel and the rider has to stick the flag in another bucket of sand. If the flag doesn’t stick, the score doesn’t count. Katie won second place in flags, which was thrilling because she had never won a ribbon in this class before. Other classes in the show include a fun costume and an egg and spoon competition. Egg and spoon is just what you think it is, the ride must carry an egg on a spoon while riding including stopping, starting, and changing direction and pace. The costume contest is just fun. Riders dress themselves and their horses in some particular theme. It is often related to the color of the horse, the horse’s name, or just some costume that the rider thinks would be fun. Katie rode a beautiful chestnut horse with a white face, who reminded her of California Chrome. Since the show was the day of the Belmont Stakes, Katie decided to dress up as the jockey, and make her horse the potential Triple Crown winner. 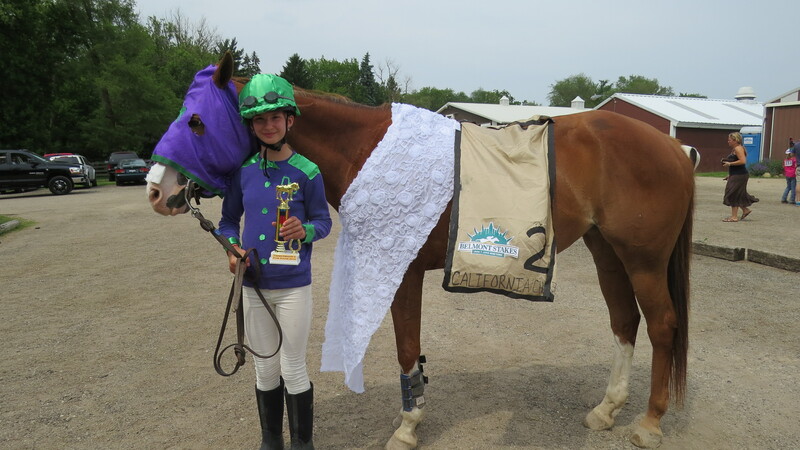 Although California Chrome did not manage to win the Belmont that day, Katie and her horse Fiona took first place in costume. Our next planned race is the first night race at Road America during the June sprints. This will be another site reading event for Jason to help him get ready for the last two races with MASS. In the next few weeks he will race at Concept Haulers with MASS then some street ovals. Thanks to Peschang Racing Sugar River Raceway, Timmerman’s Ranch, my beautiful and talented daughter Katie, and my better half Karen.